In my quest to extract as much usefulness as I can from my software and to make certain that my data is protected, I am always trying new and different options. 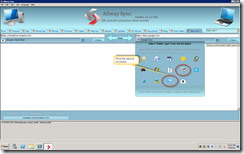 Recently I was asked if AllwaySync still worked well with SkyDrive which made me revisit the possibilities of how to exploit this as well as other cloud services. 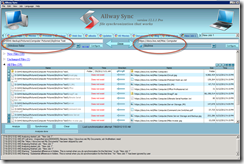 There are many different way to do things but here are just a few for your consideration when it comes to AllwaySync and SkyDrive (or most any other cloud drive). 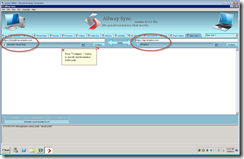 The first option is very straight forward, you establish a sync rule from a folder on your computer or server, directly to the cloud service. Below is what you end up with using SkyDrive, however many others are supported by AllwaySync such as Amazon Cloud Drive, S3, FTP, Google Docs, Azure, WebDav, and of course DropBox. 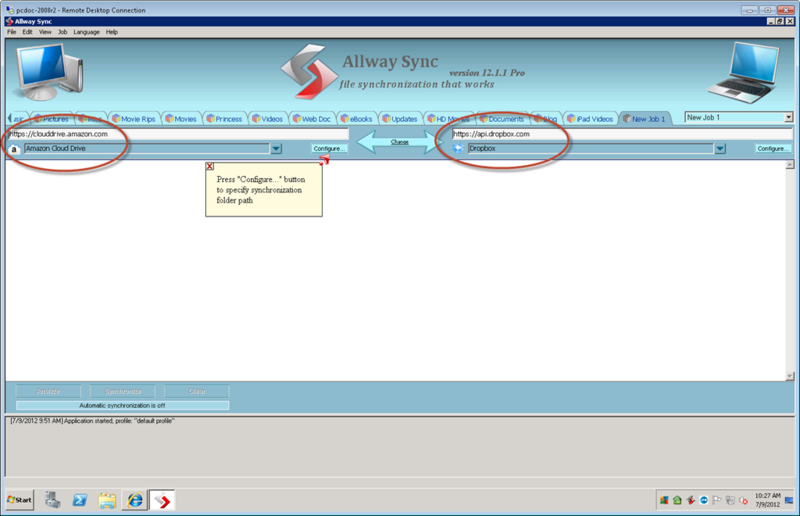 Using the concept established by an earlier article (http://bit.ly/Nfmp5G), you can use AllwaySync to sync a local folder with another local folder that is managed by say SkyDrive. 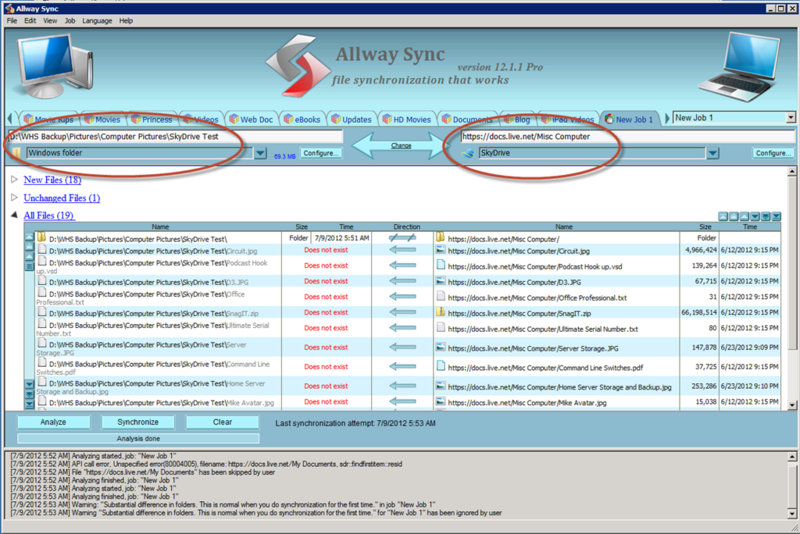 For example, if I install SkyDrive on my Home Server managing a folder called “SkyDrive”, I could create a sync rule that synchronized another local folder to the “SkyDrive” folder keeping both current at all times. The last option I want to talk about is Cloud to Cloud using AllwaySync. 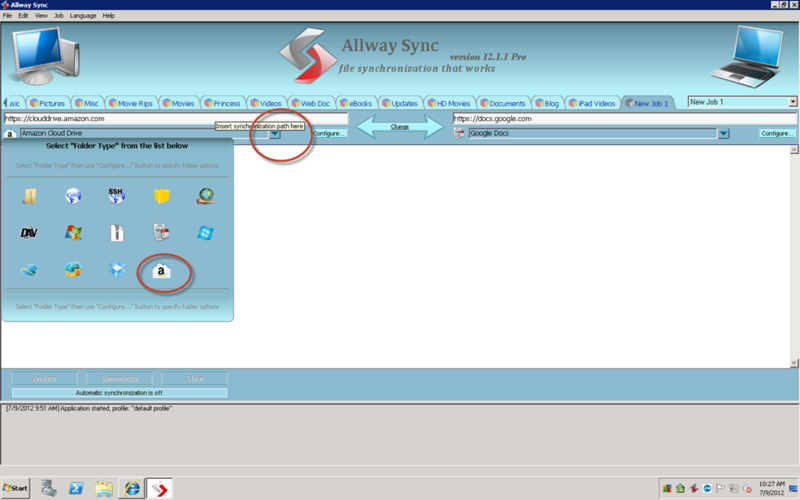 Much the same way you configured one cloud service, you can actually sync two different cloud services to one another. Keep in mind that this will be pretty slow depending on your connection speed as well as the amount of data as you will funneling everything in and out of your broadband connection. That said, it a good option for critical data that does change too frequently without manually having to manage each service independently. Another way to perform Option #3, is to combine a couple for methods from above. You can utilize the methods in Option #2 and sync two folders that are linked to their respective cloud service. 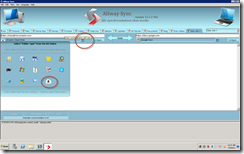 For example, if I load SkyDrive on my server and manage a “SkyDrive” folder as discussed above, and load DropBox onto the same server to manage a folder called “DropBox”, I can use AllwaySync to sync those two folders (SkyDrive and DropBox) to each other again effectively backing up/synching data on two different services. This would keep everything current in both locations which in turn gets synced to their respective services independently. No solution is perfect for everybody and you may think that some of these are an overkill. You have to decide what works for you. AllwaySync is very flexible and I am merely pointing out some of the options at your disposal. As always, make sure on any of these methods that you set the deletion properties so that you get the desired results and that your critical data stays protected.